If you hear someone shout: "Buy 300 at even! Go, go, go! Are we in? Speak to me! ", it could be Paul Tudor Jones buying S&P stock index futures, while wearing his lucky sneakers. Paul Tudor Jones interest in trading began when he traveled to New York and saw the floor of the commodities exchange. There was such an energy level there and so much excitement that he immediately knew that was the place where he wanted to work. Also an article about the trader Richard Dennis inspired him and he thought Richard Dennis had the greatest job in the world. After finishing a degree in economics from the University of Virginia in 1976, he went to work for the cotton trader Eli Tullis in New Orleans. The main duties were getting coffee, and watching the market trying to figure out what made it move up or down. One Friday morning in 1978, the day after partying with his friends, Paul Tudor Jones job was to man the phone all day during trading hours. Around noon, he fell asleep and the next thing he remembered was Eli Tullis saying: "Son, you are fired!" After being fired he called a friend and got a job on the floor of the New York Cotton Exchange, so he moved from New Orleans to New York. He became a broker for E.F. Hutton. In 1980, he began trading on the floor on his own and did that for about two and a half years. During the three and a half years as a floor trader, he had only one losing month. But Paul Tudor Jones got bored and decided to start his own fund. The other alternative was going to school again but that was not his cup of tea. "This skill is not something that they teach in business school," he said. The Tudor Investment Corporation was launched with $1.5 million under management. Paul Tudor Jones was once on the wrong side of a trade in the 1979 cotton market. The guy standing next to him said: "If you want to go to the bathroom, do it right here." Paul Tudor Jones turned around, walked out, got a drink of water, and then told his broker to sell as much as he could. His accounts lost something like 60 to 70 percent of their equity in that single day. The losses made him so depressed that he nearly quit. He told himself: "Mr. Stupid, why risk everything on one trade? Why not make your life a pursuit of happiness rather than pain." 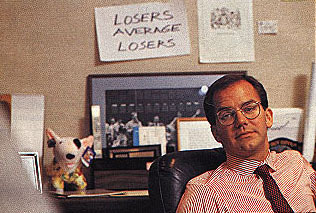 Paul Tudor Jones made money in October 1987, when the stock market fell with 22 percent in one day. In that month alone, his fund increased with 62 percent. He recalled the week of the crash as one of the most exciting periods in his life. Paul Tudor Jones and his team had expected a major stock market collapse since 1986, so they had contingency plans drawn up because of the possibility of a financial meltdown. The way they knew the crash was coming was by comparing the 1980s market over the 1920s. The two markets demonstrated a remarkable degree of correlation. They also understood that the concept of portfolio insurance would generate more selling because the people who had written these derivatives would be forced to sell more as the market fell more. Read more about how he did it here: How could Paul Tudor Jones predict the Black Monday 1987 crash? At the end of October 1988, each $1,000 originally invested in the fund was worth $17,482, while the total amount of money invested had grown to $330 million. The fund combined five consecutive, triple-digit return years - except for in 1986 when the fund realized only a 99.2 percent gain. The fund has never had a down year, so the worst year was probably 1993 when the return was 1.6 percent. In 1987, the year of the Black Monday crash, the fund returned about 200 percent. Paul Tudor Jones has also started a fund to finance the college education of 85 elementary school graduates in Brooklyn´s economically depressed Bedford-Stuyvesant section. He has become personally involved by meeting with his adopted students on a weekly basis. He has also started the Robin Hood Foundation. Paul Tudor Jones trading success is based on extreme flexibility. He can abandon his original position and is willing to join the other side once the evidence indicate the initial projection was wrong. If you are wrong – you can always get back in again. Don't be too concerned about where you got into a position. The only relevant question is whether you are bullish or bearish on the position that day. Always think of your entry point as last night's close. "I think one of my strengths is that I view anything that has happened up to the present point in time as history," he said. "What I care about is what I am going to do from the next moment on." Risk control is important when trading. Every day, Paul Tudor Jones assumes that every position he has is wrong. He as mental stops and if the stops are hit, he's out no matter what. That way, he can calculate the maximum possible draw-down each day. Paul Tudor Jones is famous for his ability to pick the bottom and the peak of the markets. His secret is to try trades several times from the long side over a period of weeks in a market which continues to move lower. He has a very short-term horizon for pain and a very strong view of the long-run direction of all markets. You might lose money while trying to pick the bottom of the market, but when the bottom is found, the winning trade will be greater compared to the smaller losing trades. The very best money is to be made at the market turns. To be a good trader you have to be a contrarian by trying to go against the market. Even though markets look their very best when they are setting new highs, that is often the best time to sell. To be successful, one has to be frightened. Paul Tudor Jones biggest hits have always come after he have had a great period and started to think he knew something. Never trade in situations where you don't have control. For example, don't risk significant amounts of money in front of key reports, since that is gambling - not trading. Don't focus on making money - focus on protecting what you already have. There is no reason to take substantial amounts of financial risk ever, one should look for opportunities with a minimum draw down pain and maximum upside opportunity. Paul Tudor Jones never thinks about what he might make on a given trade, but only on what he could lose. Paul Tudor Jones also prefers the futures market because one can generally get liquid and be in cash in a few minutes. It is often harder to sell a stock in times of market panic. Be flexible. If you are wrong – you can always get back in again. Make your life a pursuit of happiness rather than pain. You can do that with the help of risk control. Don't focus on making money - focus on protecting what you have. Don't be too concerned about where you got into a position. The only relevant question is whether you are bullish or bearish on the position that day. Losers Average Losers. Buy more of a winning position - never buy more of a losing position. The secret behind finding a market bottom is: buy multiple times on the way down. If you didn't buy at, or near, the bottom - sell the position at a small loss and try again. Do not confuse this with Losers Average Losers. You can't learn trading at a business school, you need experience.